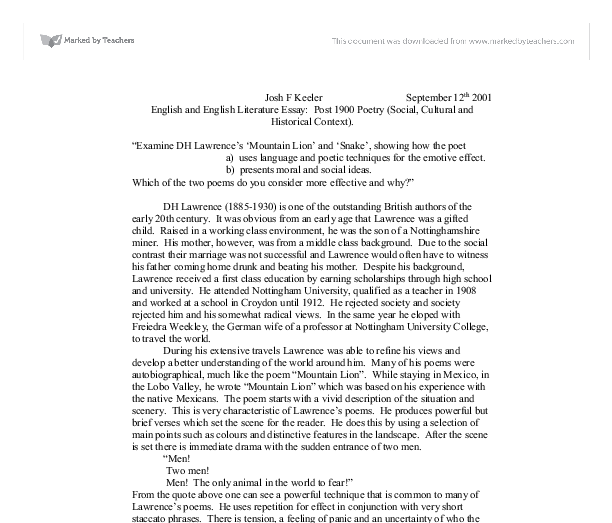 &quot;Examine DH Lawrence's 'Mountain Lion' and 'Snake', showing how the poet a) uses language and poetic techniques for the emotive effect. b) presents moral and social ideas. Josh F Keeler September 12th 2001 English and English Literature Essay: Post 1900 Poetry (Social, Cultural and Historical Context). 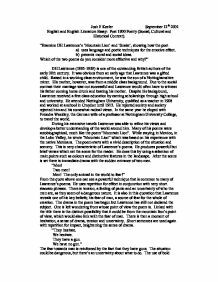 "Examine DH Lawrence's 'Mountain Lion' and 'Snake', showing how the poet a) uses language and poetic techniques for the emotive effect. b) presents moral and social ideas. Which of the two poems do you consider more effective and why?" DH Lawrence (1885-1930) is one of the outstanding British authors of the early 20th century. It was obvious from an early age that Lawrence was a gifted child. Raised in a working class environment, he was the son of a Nottinghamshire miner. His mother, however, was from a middle class background. Due to the social contrast their marriage was not successful and Lawrence would often have to witness his father coming home drunk and beating his mother. Despite his background, Lawrence received a first class education by earning scholarships through high school and university. He attended Nottingham University, qualified as a teacher in 1908 and worked at a school in Croydon until 1912. He rejected society and society rejected him and his somewhat radical views. In the same year he eloped with Freiedra Weekley, the German wife of a professor at Nottingham University College, to travel the world. During his extensive travels Lawrence was able to refine his views and develop a better understanding of the world around him. Many of his poems were autobiographical, much like the poem "Mountain Lion". While staying in Mexico, in the Lobo Valley, he wrote "Mountain Lion" which was based on his experience with the native Mexicans. The poem starts with a vivid description of the situation and scenery. This is very characteristic of Lawrence's poems. He produces powerful but brief verses which set the scene for the reader. He does this by using a selection of main points such as colours and distinctive features in the landscape. After the scene is set there is immediate drama with the sudden entrance of two men. ...read more. He does not truly mean this, he is merely trying to get his point across by putting the incident into perspective. One finds it shocking to hear him compare the death of a mountain lion to two million people, but proportionately the mountain lion is a much bigger loss. The last sentence is a final thought, which makes one realise "the gap in the world" from the death of a mountain lion. While on his travels, Lawrence also went to the island of Sicily where he wrote another similar themed poem - "Snake". This starts with drama as a snake drinks from Lawrence's water-trough. The most apparent aspect of the first verse is the over-whelming heat for which Lawrence uses repetition to get the feeling across. This is emphasised by the fact that he is wearing pyjamas because of the heat. Although there is a snake at his drinking trough Lawrence does not appear to be too worried or shocked and studies the snake in awe. He appears to be in some sort of daze. One is given this impression because he does not appear to be shocked and the fact that it is so hot. As he walks down the steps he is able to capture the feel of the carob tree above him providing shade and a "strange-scented smell". He does this by selecting a few key points about the tree. As he comes down the steps, he waits. There is emphasis on the word "wait", using repetition. Lawrence is waiting for the snake to finish. He is acting towards the snake as if it were human, waiting his turn, which is the courteous thing to do. The snake then "reaches" down from the wall. Its movement is described as somewhat leisurely. The snake is an elegant creature in looks and in movement. "And trailed his yellow-brown slackness soft-bellied down" The overall impression of the snake is very relaxed and leisurely and is not the intimidating impression of snakes that we often associate with them. ...read more. The poems both start with a dramatic incident, which is then followed later on in the poem by a change of direction. It is clear that there are many faults with human values and actions from the poems. The key difference between the poems is that 'Mountain Lion' is about Lawrence mourning the death and loss of a magnificent creature, delving into the reality of what the world is like with the lion missing. 'Snake', on the other hand, is all about the guilt that Lawrence has to face, even though no animals died. Both show the same fault with our destructive human nature. Both poems are concerned with Lawrence's experience of and reactions to specific animals in specific situations, utilising poetic techniques to convey to the reader his morals and feelings. When considering which poem is more effective, 'Mountain Lion' has a much more hard-hitting story-line than 'Snake'. There is dramatic emphasis on the death of the mountain lion to underline how precious it is, particularly when Lawrence compares its life to that of two million humans. It highlights Lawrence's strong convictions and high regard for animal welfare and shows that he was ahead of his time in such thinking. 'Snake', on the other hand, is less compelling. It deals more with the guilt experienced after committing a petty act of cruelty, which in comparison is of far less significance. It is also difficult to determine the truth of what he says because the reader is constantly aware of the possible effects of the overwhelming heat, which may be inducing a dream-like state of mind. 'Mountain Lion' also uses the poetic techniques discussed earlier more effectively. There is more opportunity to place emphasis because the situation is more dramatic. It also gives a more detailed description of the setting compared with 'Snake' which relies on the reader to use his imagination in a more generally described hot climate. Thus, 'Mountain Lion' is the more detailed and dramtatic of the two and has a more profound effect on the reader. ...read more. D H Lawrence uses a lot of natural imagery, but in particular he uses water imagery. He uses water imagery to explain his relationship with the boys. Even so this is the case, Lawrence depicts freedom in different ways in the two stories. In The Shades of Spring, the theme of freedom is defined as the freedom being able to go anywhere and make your own free choices. He says that the situation he currently finds himself in does not benefit either him or the students. As neither pupil nor teacher want to be there. Lawrence grew up in an area where mining was common. The blast furnace extracts iron from ore; fuel was heaped into the furnace until the temperature increased sufficiently.
" Leant tide-cancered" talks about the seashells being battered by the tide and the damage they obtain through this is said to be cancer, this word again could refer to the relationship in a way that shows heartache and trouble and possibly death of the of it. Peter Barry regards Saussure as " A key figure in the development of modern approaches to language study." 2 This statement is backed up by the Structural movement that begin in France in the fifties and furthered the work began by Saussure. The last line of the first stanza is the first complete sentence in the poem, and its end stop makes it stand out particularly with importance. The last line of the second stanza is a question and this introduces doubt to the poet as he fears for their 'innocence'. is moving slowly and pausing every so often as well as showing its desperation for water. The image therefore created shows us D.H. Lawrence's thoughts of the snake being similar to a human being as is presents the snake reacting in the same way a human would in such a hot environment.